When old sailors get together, drinks are stirred-up, and memories! 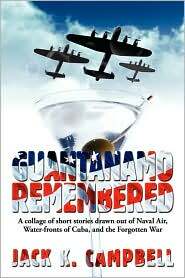 Jack Campbell's fictional portrayal of life and times at Guantanamo, before it was a prison for terrorists, causes the reader to think of beautiful women, beautiful beaches and sailors in the prime of their life trying to fight the boredom of life on a remote base. Mark "True" Truett and his wife Christy are flying to Miami for a reunion with buddies he served with in the Korean War. They all had service time in Guantanamo Bay and they had decided it was time to meet up and remember the old times, good and bad, that they had had in "Gitmo". He remembers all the encounters he had with the local Cubans, but there is one such encounter that he doesn't want his wife to find out about. The question is how do you keep it a secret with "Moon" and "Slick" around? Dutch, Moon, Slick, all names of people who knew each other decades earlier and have come together after 50 years to remind them that they were young once. Young in love and life, they remind each other of the times they spent on "Gitmo" and how they relieved their boredom with each other and the locals. It was the 1950's and times weren't as fast as they are now. Now go back and relive the past with True and the guys, see what secrets they want kept and memories they thought were buried at sea. Jack K. Campbell, educator and writer at heart, is from the Midwest heartland, born in Chicago, raised there and in suburban Downers Grove, further educated at Cornell College, the University of Illinois, and Columbia University. Jack is the author of THE CHILDREN'S CRUSADER, the definitive biography of Colonel, Francis W. Parker, who lead the campaign for Progressive Education (New York: Teachers College Press, 1967). After four years of naval services during the Korean War, he taught high school history on Long Island an northern New Jersey, social studies and the history of education at Brooklyn College, the cultural foundation of education at Texas A&M University, retiring there as professor emeritus. He is married to Mary Woods Campbell, and father of Decker, Jon, and Arthur. Click on the image to the left to read a few pages from the book.